When you come home from a trip you are always asked the same questions: What was the weather like? How was the food? And, what did you do? Forget describing how you spent two weeks sat on the beach, sipping on local beer, why not describe how you reached the rooftop of Indochina? Or how you saw glow in the dark plankton in Cambodia? Make your friends, family and colleagues jealous as you tell them how you completed your very own South East Asia bucket list. Riding a moped, scooter or anything on two wheels can be one of the most liberating experiences you’ll have on your holiday to Vietnam. It gives you a cheap and extremely fun sense of freedom to explore South East Asia in all its beauty. Scooters and motorbikes dominate the roads in the part of the world thanks to their affordability and durability, but also, because they allow you to zip around traffic and town easily. A ride in Bangkok might be a blur of horn noises, flashing lights and crazy pedestrians zig-zagging through the traffic, but it is an unforgettable experience. On the flip-side, picture yourself cruising along a beautiful coastal road with the sun beating down, or through winding mountain climbs into the dense green forests. Either are certainly worthy of being on your South East Asia bucket list. While riding a scooter can get your heart racing because of the traffic or the glorious locations you discover, you could get the blood pumping with a hike up the highest mountain in Vietnam. Mount Fansipan, close to the town of Sapa, stands at 3,143 meters high and is yours to overcome. Known by locals as “Hua Si Pan” – Huge Rock – this colossus can be tamed after a two-three day hike, though for more experienced hikers it is possible to do it in one day. However, you can cop out and use the cable car. But why would you do that? Imagine the stories, the photographs, memories and satisfaction that you will have when you reach the summit and stare out across much of South East Asia. How many people do you know can claim that they have hiked Vietnam’s biggest mountain anyway? It is one of the most iconic destinations in South East Asia and amongst the most significant archaeological sites in the area. 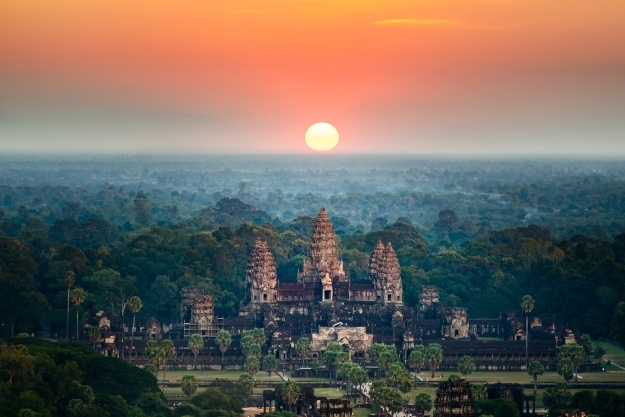 Angkor, the UNESCO World Heritage site stretches for over 400 square kilometres, containing stunning examples of ancient architecture from the ninth and fifteenth centuries. Situated in Siem Reap, the northernmost province of Cambodia, Angkor was the centre of the Khmer Kingdom and has now become one of the most visited attractions in Asia. Fortunately for you, the gates open at 5:00am year round, meaning that you have a great opportunity to witness the sunrise at Angkor Wat, though you should book your tickets a day in advance to beat the crowds. Head towards the ponds, with the temples in the background. This is the quintessential image, but it does mean you have a stunning place to sit as the sun rises from behind them. Sadly, this can get a little crowded. If that is the case, head up to Angkor Hill and look down on those jostling for the perfect camera shot. Wat Rong Khun, or the White Temple, is one of the most incredible pieces of architecture in the world. Dramatic, magical and striking, you will need to take a bus journey from Chiang Mai to Chiang Rai for a sight of this Buddhist temple. When you think of visiting South East Asia, you probably plan a holiday to Vietnam or Thailand, but for this addition on our bucket list, you will need to venture to Laos. Set in the heart of a lush forest, the Kuang Si waterfalls are like an oasis amongst the humidity and heat. The multi-tiered pools of natural turquoise waters are perfect for a refreshing dip, or you can opt to hike up to the top of the waterfalls for incredible views and photo opportunities. When anyone starts talking about a bucket list, of course, we picture natural wonders and tranquillity. But no South East Asia bucket list will be complete without mentioning Bangkok. 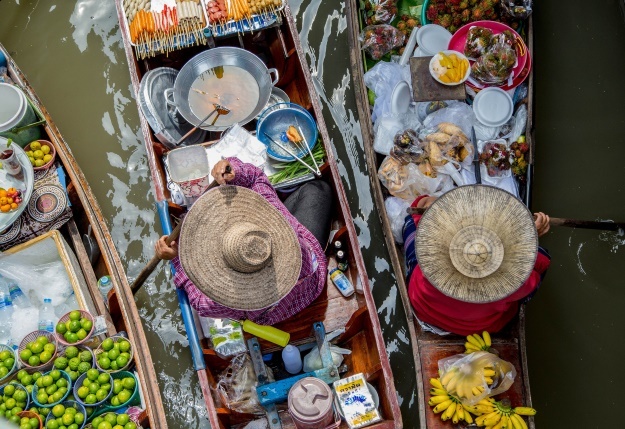 Head to the floating market in the city and sit on Thailand’s version of Venice’s gondolas, as you haggle for local produce and souvenirs. This is a throwback experience to times gone by. The flurry of activity and melting pot of smells and sounds makes this an unforgettable experience. Heading on a Thailand holiday in November? Well you’re in for a treat. 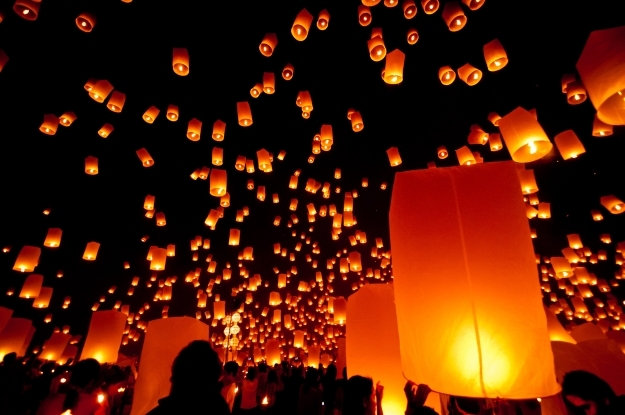 Chiang Mai hosts the Yi Peng Lantern Festival, where countless lanterns are released into the night sky. It really holds its own among Asia’s best festivals. How many times have you been lying on the soft sand of a tropical beach, drink in hand, gazing out at the blue sea without taking a second thought about what could be beneath the waves? 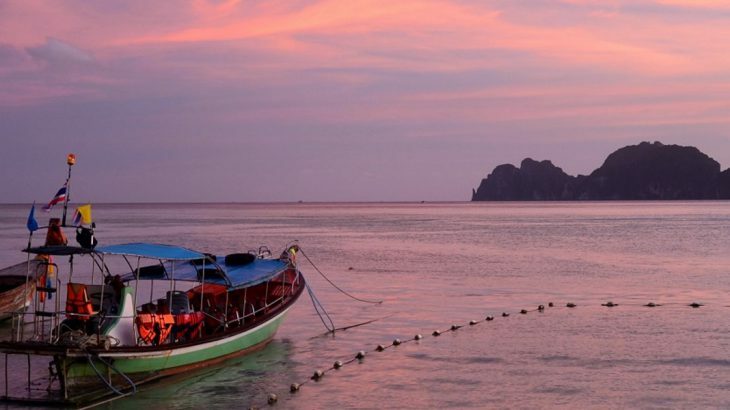 Well South East Asia and Thailand in particular, are home to some of the best scuba diving spots in the world. So why not tick scuba diving of your bucket list? There are plenty of options when it comes to scuba diving, but make sure you are learning with either Scuba Schools International (SSI), who can be found in 110 countries across the world, or the Professional Association of Diving Instructors (PADI). If you want a totally unique museum experience, then visit the Cu Chi Tunnels. This fascinating site has been preserved as a war museum, providing an insight into the underground life of Vietnamese soldiers during the war. Around 120km of underground tunnels, trapdoors, living areas, kitchens, storage, hospitals, armouries and command centres are right beneath your feet in this incredible museum. Dug with bare hands in the 1940s, they were used as refuge and were home to thousands for many years. Sapa is a magical town in the remote north-western corner of Vietnam. When the mist descends across the valley this setting becomes even more staggering. A prime location for trekking and to experience an authentic Vietnam, you can tour the iconic rice paddies, visit small villages and meet ethnic tribes. Across Sapa you will find a landscape that looks as close to the Eden as is possible. The magnificent Lake of Sapa, Heavenly Gate and the Iguazu Thac Bac – silver waterfall- are not to be missed if you are find yourself exploring the area. Plan your visit between April and May to really make the most of the flowering vegetation and unspoilt views of the area. Ha Long Bay is yet another in a long list of World Heritage Sites in South East Asia. First inscribed in 1994 by UNESCO, the area remains remarkably unchanged. While you can take to the water on a boat with one of the many tours, it is certainly worth hiring out some kayaks and really appreciating the floating homes and incredible caves. Head towards Thien Chung and witness some of the finest examples of stalagmites and stalactites, or float past the villages and buildings that house some 1,600 people on the water. 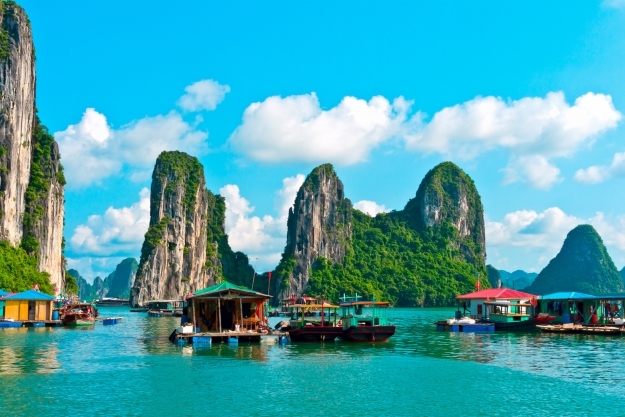 Protected as a World Heritage site, Halong Bay is one of Vietnam’s most popular attractions, with companies offering a chance to explore the limestone isles on a cruise. Legend has it that a celestial dragon and her children was sent by Jade Emperor to prevent an invasion. The dragon spat out spat out thousands of pearls which formed the jagged chain or islands right into the path of the enemy fleet. After the victory, the dragon chose to stay, giving Halong its name – “dragon descending”. Like something from Avatar or Life of Pi, this spectacle is something truly unforgettable. Koh Rong’s waters appear to be reflecting the stars in the night’s sky as bioluminescent plankton appear to glow from the deep blue depths. This natural phenomenon may seem like a scene from a sci-fi film from a distant planet, but really this can happen in places with low light pollution. But don’t get bogged down in the details. Go out on a tour at night and witness something beautiful. You can’t go on a Vietnam holiday and not visit Phong Nha and the Nha-Kẻ Bàng National Park. Home to the colossal Han Song Doong, which also makes its way onto our bucket list, it is the scene of immense natural beauty and truly spectacular scenery. The park was designated a World Heritage site back in 2003, notably for the significant natural landscape which includes the Asia’s oldest karst mountains, which date back 400 million years. The area spreads across 885 square kilometres and includes unspoilt jungle, deep caves and underground rivers. Elsewhere you can see Asian black bears, hundreds of species of birds, reptiles and amphibians, macaques, langurs and the threatened large-antlered muntjacs. Whether you are on holiday in Vietnam or any other corner of the world, one of the first things you miss when you return home is the food. Whether you found your new favourite dish, or you cannot come to terms with the lack of street food available to you, you’re going to want to be able to relive the satisfaction you got from biting into some of the local cuisine. So why not learn the lifelong skill of cooking authentic food right at the source? Across the whole of South East Asia you will find cooking classes that teach you about the native spices and ingredients, before helping you to turn them into a dish. Everyone knows someone who has been to Thailand or an Asian country and has had pictures of themselves riding an elephant, or sitting precariously next to a tiger. While these pictures may appear exciting and pleasant, the truth it there is a lot of animal cruelty going on behind the scenes. And what’s worse, they are only still running because of a consistent stream of tourism. When you visit any destination you want to be able to see the native wildlife, because in the UK we usually have to do with some pigeons and the odd fox. While there is no problem with this, it is vital that you choose a responsible organisation who can arrange such an experience. Elephant Nature Park is one such project. 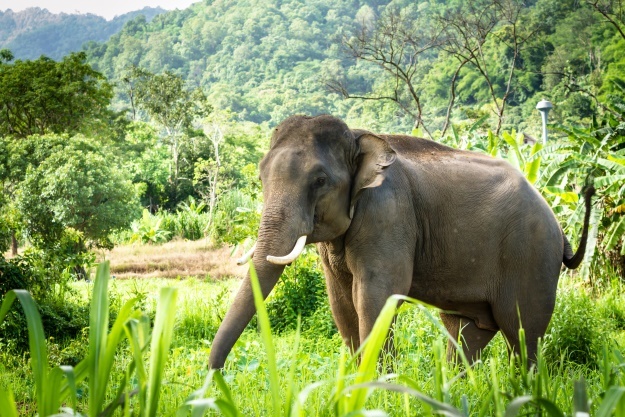 Set in the Chiang Mai province of Northern Thailand, it has been a sanctuary and rescue centre for elephants since the 1990s. You can visit the park, which also houses buffalo, dogs, cats, birds and a number of other rescued animals. A few animals come to mind when you think of South East Asia, but few compare to the real jungle VIP. 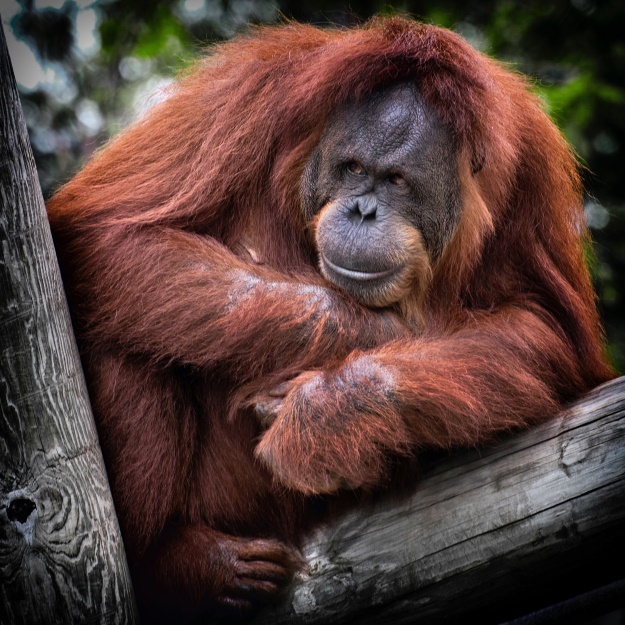 Head to Borneo as part of your bucket list and visit the real king of the swingers at an orangutan sanctuary. Established in 1975, the Semenggoh Wildlife Centre cares for wild animals that were once illegal pets, orphaned or found injured in the forests. The aim of the centre is to rehabilitate all in its care to a stage that allows them to be released back into the wild, whilst educating visitors about how vital animal conservation is. Borneo has an incredibly rich ecosystem. Gunung Mulu National Park is just one of many parks in the country. Recognised by UNESCO in 2000 for its significant wildlife and landscape, you can see gibbons, sun bears, stunning caves and misty rivers. Why not kick back and cruise down the Mekong River as part of your South East Asia bucket list? The world’s 12th longest river runs through six different countries, with each calling it something different. On your Vietnam holiday you may hear the locals call it the Nine Dragons River, (Song Cuu Long). 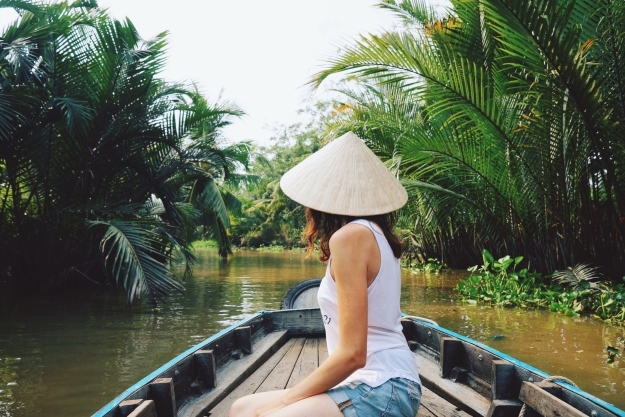 The Mekong Delta is a term describing the western part of Vietnam, comprising of 13 provinces. You can find many itineraries that will let you take a ride down the river, many of which are one or two days long. Though it is truly spectacular at sunrise and sunset. Why not be dressed to impress during your Vietnam holiday? Slip out of your loose fitting shorts, that t-shirt, light dress and sandals, and step into possibly the cheapest tailors on the planet. 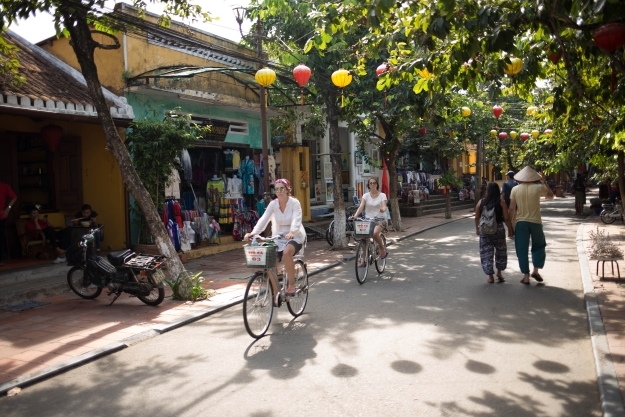 Hoi An is a beautiful coastal town steeped in history. But in modern times, it is Vietnam’s answer to Savile Row. Go and get your measurements for a silk dress or suit that can be as colourful and outlandish as you wish. Take your pick from fabrics, colours and accessories and the tailors will work through the night to provide you with your new favourite outfit. Visiting Vietnam on a budget? Don’t worry. A fully tailored suit, minus a waistcoat, will set you back just £50. Widely considered to be the world’s largest cave, Hang Son Doong is more than five kilometres long, 150 meters wide and 200 meters high. The size of this geographical wonder is staggering. It is so big that it warrants not only its very own jungle and river, but also its own climate. If you are looking for a natural site to see on your Vietnam holiday, then you can’t look past this. It was first discovered by Ho Kkanh, a Vietnamese logger turned cage guide, who used it as refuge during a storm in 1991. However, he was unable to find it again. 18 years later it was rediscovered and is now open to tourists. Cradling the border between China and Vietnam, the Ban Gioc-Detian Falls are South East Asia’s equivalent to Niagara Falls. It is the largest waterfall in Asia and the fourth largest that sits along a national border. Karst peaks surround the torrent, as it flows down a three-tiered cliff. The scenery changes throughout the year, with a fiery-red blossom in the spring, a golden yellow mist from the waters in august, whilst in the summer you will see the strongest flow of waters. In the winter it dies down somewhat, but the cold chill makes for a beautiful sight. South East Asia is a treasure trove of wonderful destinations, stunning landscapes and vibrant people. It is almost impossible to document everything that you can do in the region, but we hope that we have given you some inspiration for your every own bucket list. Book an escorted tour to Southeast Asia with the UK’s leading Asia Experts, Wendy Wu Tours. Our fully inclusive tours visit all the major sights of your chosen destination and introduce you to the local culture, making for an unforgettable holiday. Borneo, Cambodia, Laos, Thailand, Vietnam adventure, top things to see, unesco heritage site, wildlife. permalink. What has Japan given the world?